Fortune-telling and divination with the Symbolon deck of cards (Symbolon reading) is a powerful and precise method, by which you can reveal personal insights and symbolism in your daily life. (You can skip reading and view all readings) The cards are designed for psychological purposes and to work with your memory, which can greatly help you recreate memories from past lives. The detailed information that the Symbolon deck will give you can then be used to understand the deep subconscious reasons of your soul and even foretell the future. These cards will help you learn more about the unseen abstract elements and energies of your high spirit. Symbolon offers you a deep psychological self-analysis, by which you will uncover the secrets of your being and gain a new perspective for numerous situations and areas in your current life cycle. Be it relationships with people around you and your partner, your personal spiritual growth, your career, business and professional path or any other part of life that interests you. The Symbolon cards, developed by Peter Orban, Ingrid Zinnel and Thea Weller, are relatively modern piece of art, but they are inspired by ancient mythology and history, so they bear the wisdom of the generations before. The images on the cards represent various elements and motifs from a wide range of different cultures spanning across several centuries. If you’re a person that prefers a more psychological approach to divination and oracles, you will find that these cards fit perfectly into your daily life. The deck possesses an inherent power to raise the unconscious into the higher level of consciousness and can be used as a form of therapy. Different Symbolon spreads offer countless possible combinations of cards, which can disclose a whole range of human experiences, provide details about numerous colorful life situations and show what lies ahead of you – allow you to look around the corner. You’re not required to make specific interpretation of the basic symbols, because the images usually speak for themselves – the cards connect directly with your higher spirit through your intuition and various other subtle instincts, feelings and emotions. 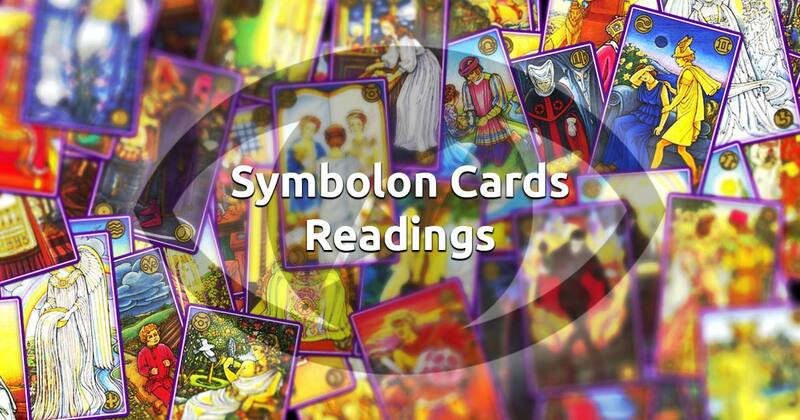 Some Symbolon readers actually believe the cards to be a “painting of the soul”, giving you guidance on your strengths, weaknesses and potential of your personality, a complete detailed drawing of your path – what’s behind, what is now and what is to come. We have collected some of the best Symbolon readings and put on our website for your use, with which we aim to be your spiritual navigator through difficult times. If you want to gain a deeper insight into a situation, a problem or a question and see new ways of dealing with it, just choose one of the appropriate spreads below and start your free Symbolon reading session. Enjoy!